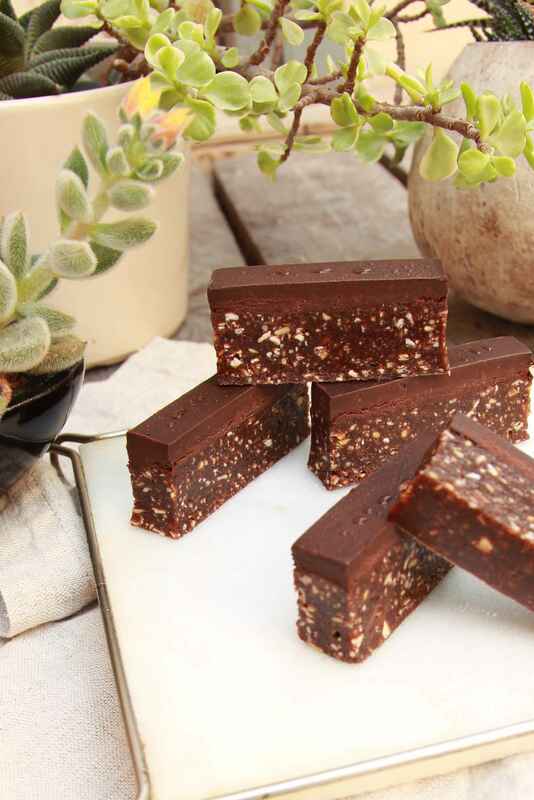 Vegan No Bake Chocolate Slices – Paleo Friendly! 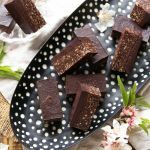 If you’re in the mood for some chocolate goodness just minus the baking then my no bake chocolate slices are perfect for you! They’re gluten free, refined sugar free, paleo friendly and packed with toasted coconut and almond flakes! They’re freezer friendly, and most importantly they’re not too sweet! So how did I end up making these easy delights? Well it all began a few days ago. I was craving chocolate, but had run out! Can you imagine? The weather was smoking hot outside, so you can understand why I didn’t want to leave the house to buy some, let alone turn on my oven! Well, when there’s a will for some chocolate goodness, there’s a way! As it turns out it was easier than I thought to satisfy my chocolate cravings! For the ganache I added coconut oil and cocoa, then sweetened it with maple, and added a hint of coconut cream to smooth it out. 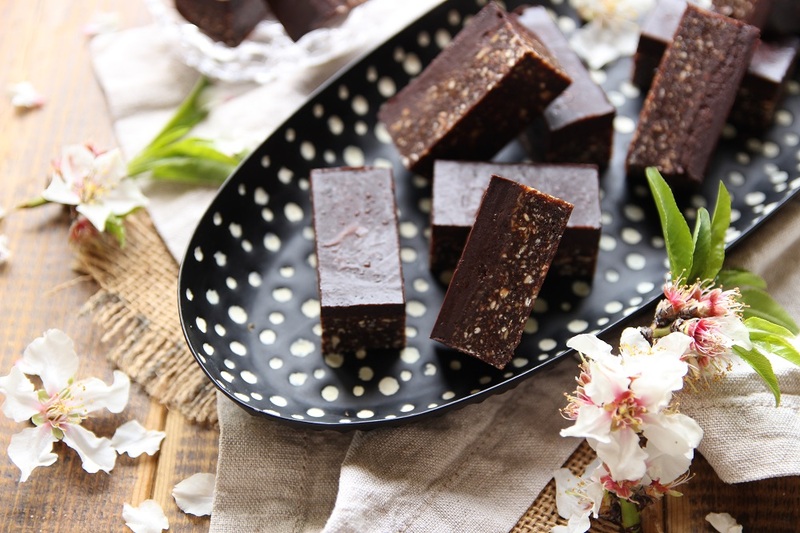 For the chocolate base, I added a splash of vanilla, cocoa powder, lots of medjool dates, and a generous amount of the toasted almond and coconut flakes! Heat a sauce pan on medium heat. When it’s hot add the coconut flakes and toss until they’re lightly toasted then transfer to a clean plate and repeat with the almond flakes. Add the medjool dates, pits removed, into a food processor and blend to a paste. Next, add the coconut flakes and almond flakes and blend until they break down into fine crumbs. Finally, add the vanilla essence, almond butter and cocoa powder, and blend until combined. Transfer into an 8 x 4 x 1/2-inch loaf pan (20 x 10 x 6 cm) lined with baking paper, and press the mixture down until you have an even base. Place in the freezer while we prepare the chocolate ganache. 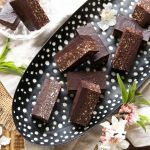 For the vegan chocolate ganache, place the coconut oil, maple syrup, and cocoa powder into a bowl and whisk well until it starts to break. Next, add the coconut milk and mix until your ganache is smooth. If needed, add an extra tablespoon at a time. Don’t over mix it. Your ganache should be thick and smooth. *Make sure that your coconut oil is melted, but at room temperature, and that your coconut milk doesn’t have any unnecessary ingredients in it. I use this brand. Next, pour it onto your base and smooth it out with a spatula, then gently tap the pan onto your counter top to remove any bubbles and bumps. Pop the pan into the freezer for 20 minutes, or until set, then take it out, *slice into desired size and enjoy! *To ensure a smooth, clean cut, dip a smooth knife into a mug of warm water, dry the knife well, then slice into bars. Repeat this step with every slice. Have you tried my Vegan Chocolate Muffins yet? They’re gluten free, oil free, refined sugar free, easy to make, paleo friendly, and insanely delicious! 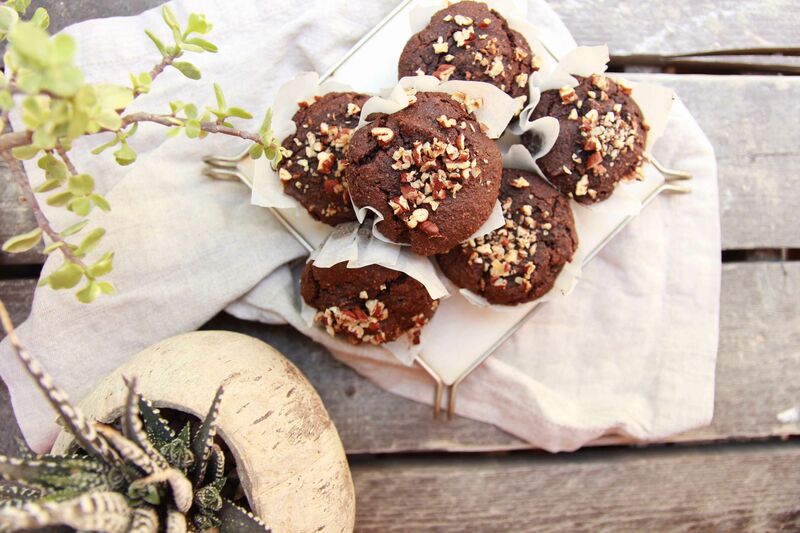 ← Vegan Chocolate Muffins – Paleo Friendly! Love these!! They look delicious.. Packed with such wholesome ingredients 🙂 Perfect for guilt free yet indulgent binging 😬 Definitely making these soon!